AAE 2016: Welcome drinks and launch of a special publication in conjunction with Architectural review to commemorate 175 years of Architectural Education at UCL. Held at Bartlett School of Architecture. 140, Hampstead Road, London. 07/04/2016. AAE 2016: Jane Anderson and Ruth Morrow run workshop during AAE, The Research Based Education 2016 international peer reviewed conference. Held at Bartlett School of Architecture. 140, Hampstead Road, London. 07/04/2016. AAE 2016: Head of School Bob Sheil speaking during the welcome drinks and launch of a special publication in conjunction with Architectural review to commemorate 175 years of Architectural Education at UCL. Held at Bartlett School of Architecture. 140, Hampstead Road, London. 07/04/2016. AAE 2016: Kinda Al Sayed presents workshop during AAE, The Research Based Education 2016 international peer reviewed conference. Held at Bartlett School of Architecture. 140, Hampstead Road, London. 07/04/2016. AAE 2016: Perry Kulper of the University of Michigan USA speaking on Design Methods: Deep agencies for Spatial Production during AAE, The Research Based Education 2016 international peer reviewed conference. Held at Bartlett School of Architecture. 140, Hampstead Road, London. 08/04/2016. AAE 2016: Keynote speaker Achim Menges talks about Production during AAE, The Research Based Education 2016 international peer reviewed conference. Held at Bartlett School of Architecture. 140, Hampstead Road, London. 08/04/2016. AAE 2016: Keynote speaker Achim Menges takes question from the audience during AAE, The Research Based Education 2016 international peer reviewed conference. Held at Bartlett School of Architecture. 140, Hampstead Road, London. 08/04/2016. AAE 2016: Audience listen to presentations during AAE, The Research Based Education 2016 international peer reviewed conference. Held at Bartlett School of Architecture. 140, Hampstead Road, London. 08/04/2016. AAE 2016: Coffee break during AAE, The Research Based Education 2016 international peer reviewed conference. Held at Bartlett School of Architecture. 140, Hampstead Road, London. 08/04/2016. AAE 2016: Attendees chat during a break at AAE, The Research Based Education 2016 international peer reviewed conference. Held at Bartlett School of Architecture. 140, Hampstead Road, London. 08/04/2016. AAE 2016: Keynote presentation by Izaskun Chinchilla on Curiosity during AAE, The Research Based Education 2016 international peer reviewed conference. Held at Bartlett School of Architecture. 140, Hampstead Road, London. 08/04/2016. AAE 2016: Bartlett’s Head of School Bob Sheil Introduces the AAE, The Research Based Education 2016 international peer reviewed conference. Held at Bartlett School of Architecture. 140, Hampstead Road, London. 08/04/2016. AAE 2016: Question from an attendee during panel discussion with Flora Samuel, Lorraine Farrelly, Sandy Litchfield and Toby Lewis. AAE, The Research Based Education 2016 international peer reviewed conference. Held at Bartlett School of Architecture. 140, Hampstead Road, London. 08/04/2016. AAE 2016: Etienne Wenger delivers his keynote talk during AAE, The Research Based Education 2016 international peer reviewed conference. Held at Bartlett School of Architecture. 140, Hampstead Road, London. 08/04/2016. 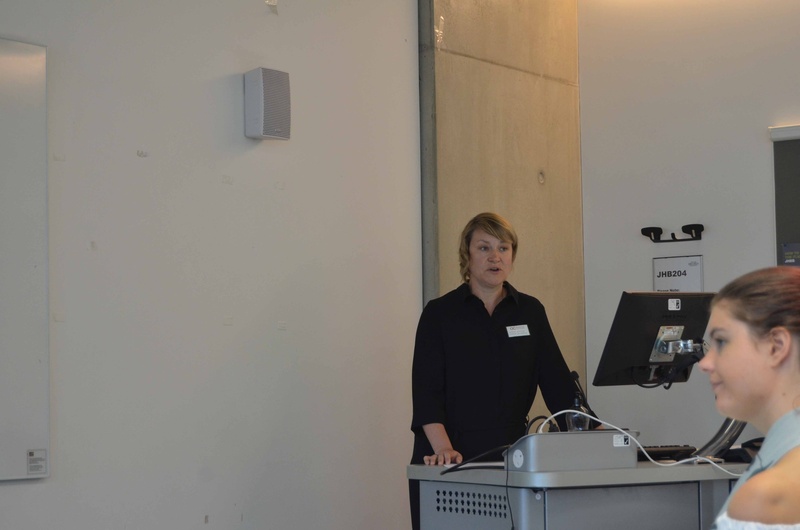 AAE 2016: Rachel Cruise (University of Sheffield) talks about Architecture and Engineering during AAE, The Research Based Education 2016 international peer reviewed conference. Held at Bartlett School of Architecture. 140, Hampstead Road, London. 08/04/2016. AAE 2016: Lunch in the Bartlett workshop during AAE, The Research Based Education 2016 international peer reviewed conference. Held at Bartlett School of Architecture. 140, Hampstead Road, London. 08/04/2016. AAE 2016: Hannah Vowles chairs panel discussion with Doug Gittens, Paula Craft-Pegg and Luke Pearson during AAE, The Research Based Education 2016 international peer reviewed conference. Held at Bartlett School of Architecture. 140, Hampstead Road, London. 08/04/2016. AAE 2016: Paula Craft-Pegg (University of Portsmouth) presents Playing with architecture. Attendees were asked to write key words that were used in Crits onto dice during AAE, The Research Based Education 2016 international peer reviewed conference. Held at Bartlett School of Architecture. 140, Hampstead Road, London. 08/04/2016. AAE 2016: Questions from Attendees during AAE, The Research Based Education 2016 international peer reviewed conference. Held at Bartlett School of Architecture. 140, Hampstead Road, London. 08/04/2016. AAE 2016: Lorraine Farrelly (University of Reading) speaking about Education for Uncertainty during AAE, The Research Based Education 2016 international peer reviewed conference. Held at Bartlett School of Architecture. 140, Hampstead Road, London. 08/04/2016. AAE 2016: Annmarie Adams and Basem Eid Mohamed (McGill University Canada & Abu Dhabi University UAE) present Design education in the age of Instagram during AAE, The Research Based Education 2016 international peer reviewed conference. Held at Bartlett School of Architecture. 140, Hampstead Road, London. 08/04/2016. AAE 2016: Etienne Wenger chats with Alan Pann during a break of AAE, The Research Based Education 2016 international peer reviewed conference. Held at Bartlett School of Architecture. 140, Hampstead Road, London. 08/04/2016. AAE 2016: Toby Lewis (University of Bath) talks about the Process of Design during AAE, The Research Based Education 2016 international peer reviewed conference. Held at Bartlett School of Architecture. 140, Hampstead Road, London. 08/04/2016. AAE 2016: Lesley Lokko presents her Keynote talk on Risk during AAE, The Research Based Education 2016 international peer reviewed conference. Held at Bartlett School of Architecture. 140, Hampstead Road, London. 08/04/2016. AAE 2016: Mary Jane Rooney speaking about Nurturing the Citizen designer during AAE, The Research Based Education 2016 international peer reviewed conference. Held at Bartlett School of Architecture. 140, Hampstead Road, London. 08/04/2016. AAE 2016: Murray Fraser chairs the panel discussion with Flora Samuel, Lorraine Farrelly, Sandy Litchfield and Toby Lewis during AAE, The Research Based Education 2016 international peer reviewed conference. Held at Bartlett School of Architecture. 140, Hampstead Road, London. 08/04/2016. AAE 2016: Question from Bob Sheil during AAE, The Research Based Education 2016 international peer reviewed conference. Held at Bartlett School of Architecture. 140, Hampstead Road, London. 08/04/2016. AAE 2016: AAE, The Research Based Education 2016 international peer reviewed conference. Held at Bartlett School of Architecture. 140, Hampstead Road, London. 08/04/2016. AAE 2016: Etienne Wenger encourages small group discussions during his keynote talk during AAE, The Research Based Education 2016 international peer reviewed conference. Held at Bartlett School of Architecture. 140, Hampstead Road, London. 08/04/2016.